Vintage Arteluce Italian spot sconces with a 360 degree swivel chrome stem. Shown with and without bulb. Install notes: 3.75" diameter backplate. Backplate can adjust 360 degrees with nut on back of stem for desired screw orientation 2.75" screw hole spread. Details: Tube is 5.25" x 2" diameter. E26 Edison lightbulb base Not UL listed. Wiring tested in good condition. No ground wire. Some surface scratches to black paint. 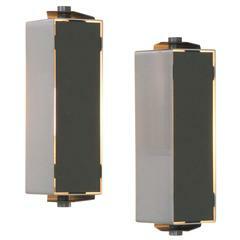 Rare Jo Hammerborg rotating lacquered metal and brushed aluminium wall sconces. 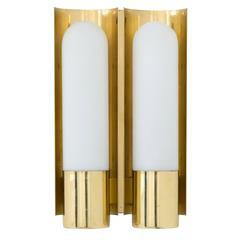 Very heavy and substantial brass double wall sconce. Bright yellow enamel Pinocchio lamp pair. Can be oriented as a table lamp or hung as a wall sconce. The lamps adjust in many directions. Euro wiring with a euro plug.